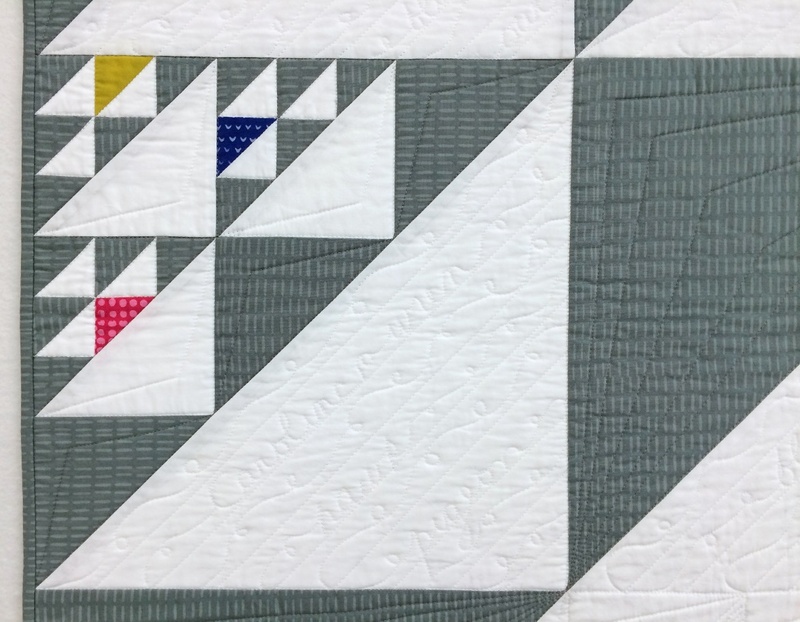 The Greenville Modern Quilt Guild issued a Birds in the Air challenge back in April with the entries due at the August 2017 meeting. 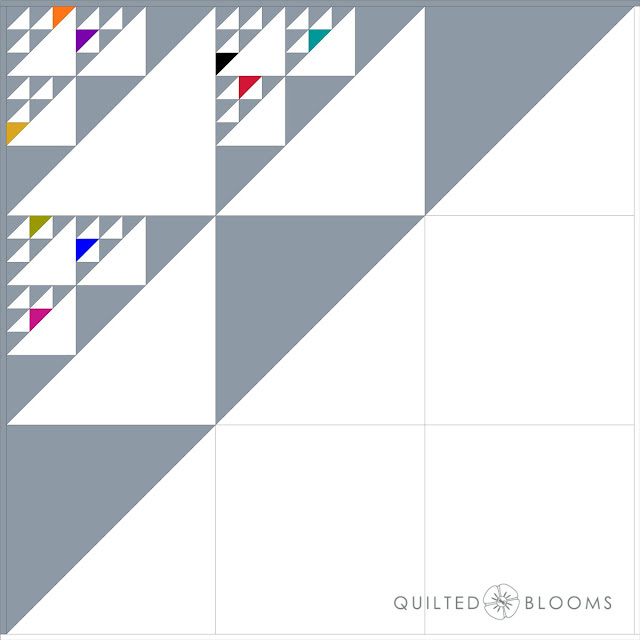 After much shuffling, rearranging and resizing of the traditional Birds in the Air quilt block in EQ7, I finally decided on this layout which became the final quilt. 1. 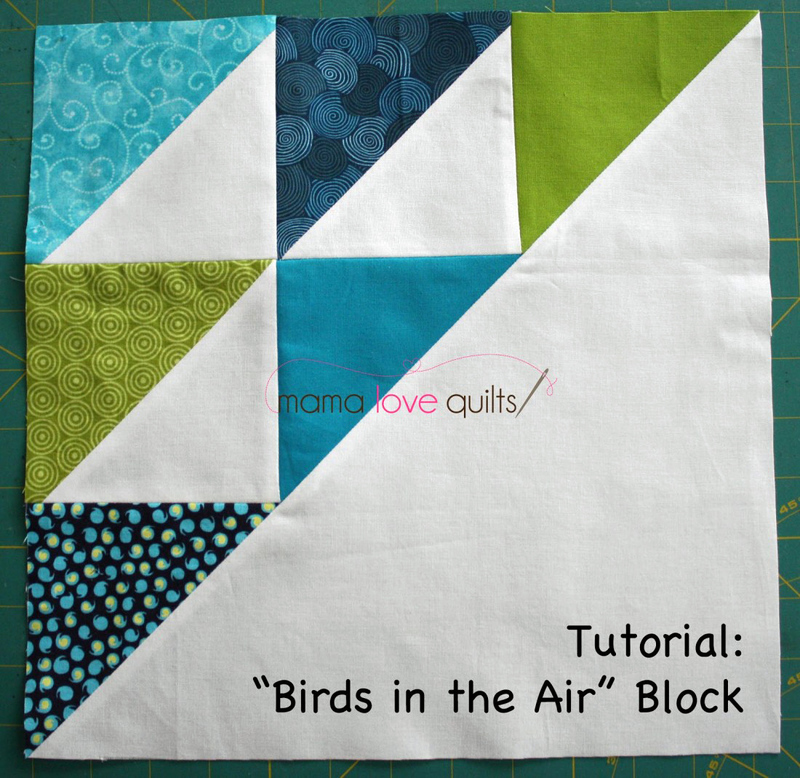 Interpret the Birds in the Air quilt block into a design of your choosing. 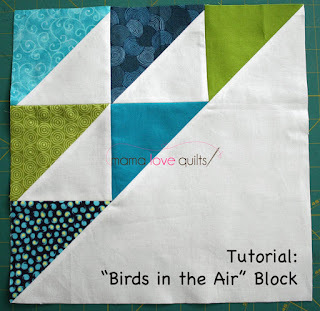 We were directed to the Birds in the Air tutorial by Nicole at Mama Loves Quilts. Coming up with a design was the hardest part since I had to incorporate 3 of the modern elements. If I used exaggerated scale, I would automatically have another element, negative space. And a design with no borders would take care of a 3rd element. I decided to break down the triangles into smaller Birds in the Air blocks. Think about the the math sequence 1, 3, 9, 27, 81 and so on where each sequential number is multiplied by 3. 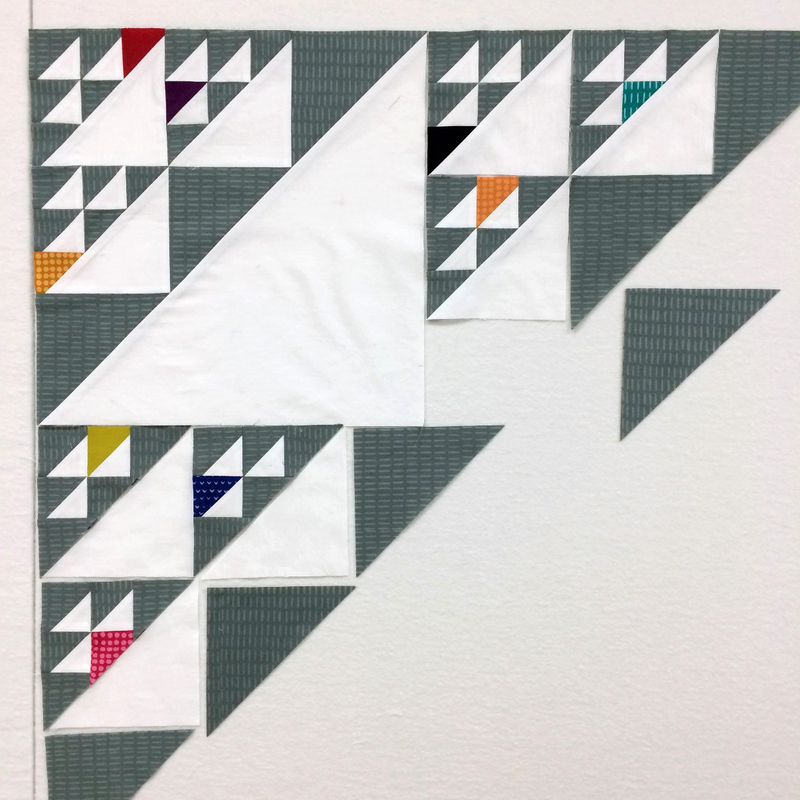 For designing in EQ7 it was easier to to create the largest white triangle from HSTs and plain squares but that's not how it was pieced. The triangle was created by cutting one large triangle on the diagonal. 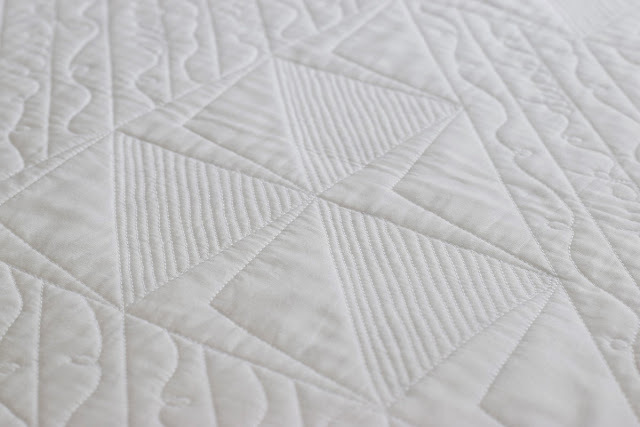 I didn't want any seam lines to interfere with the quilting. This photo was taken the Tuesday before the Saturday deadline of August 12th. The deadline was quickly approaching. I used only Hoffman Indah Batiks in the construction. The gray print is Stitches in Pebble. The white is even an Indah Solid in Zinc. In each of the nine smallest Birds in the Air blocks I added one colored triangle for a little variation. 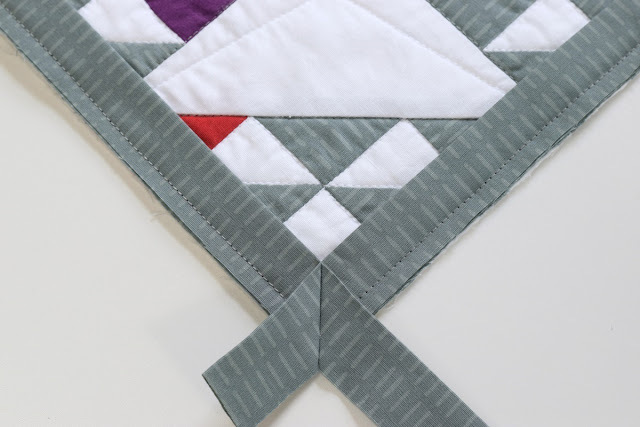 I shouldn't have said coming up with the design was the hardest part because choosing a quilting design(s) is by far the biggest challenge for me with any project. Here's a rough sketch of what I decided to quilt. 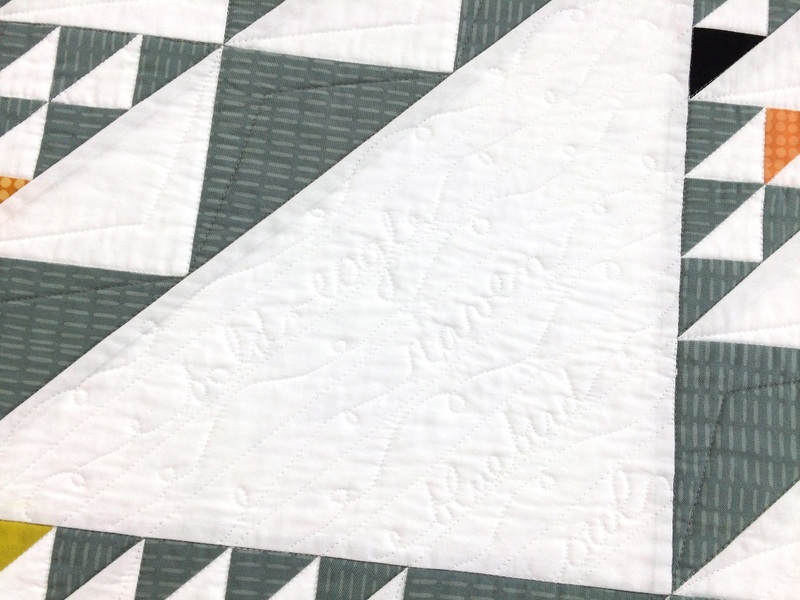 I decided to outline the small triangles which finished at 1 1/4" by stitching in the ditch as much as possible. 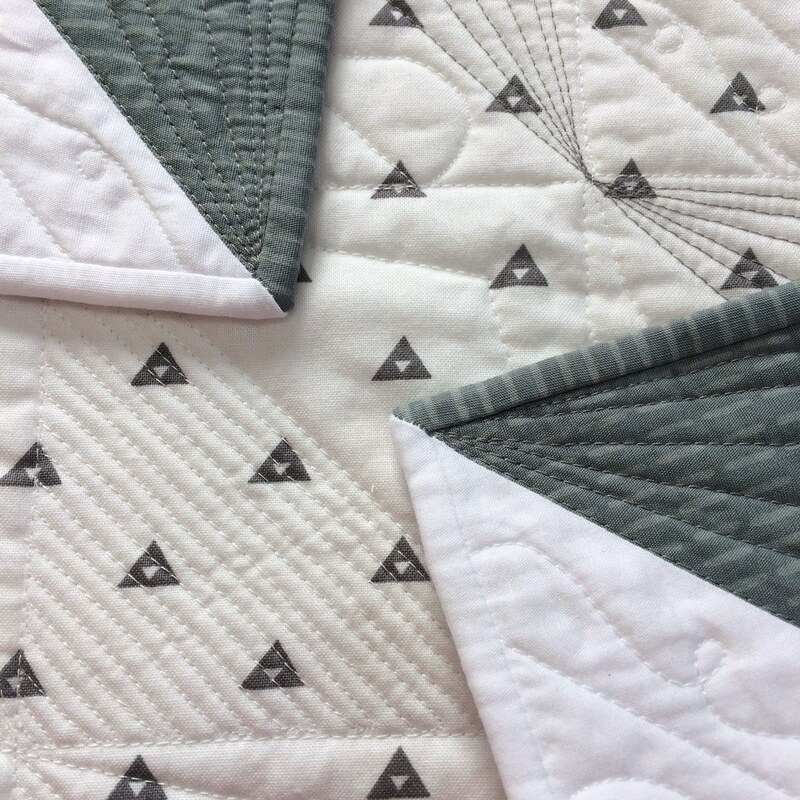 For the medium size triangles I quilted one roof top design in each triangle. I like how a chevron design was created across the blocks. I created more birds in the air by ghost quilting in the negative space. I did the dense back and forth free hand and it shows. I was originally planning to quilt only the parallel lines in the large triangles but when I was through, it was a little sparse. So now what? 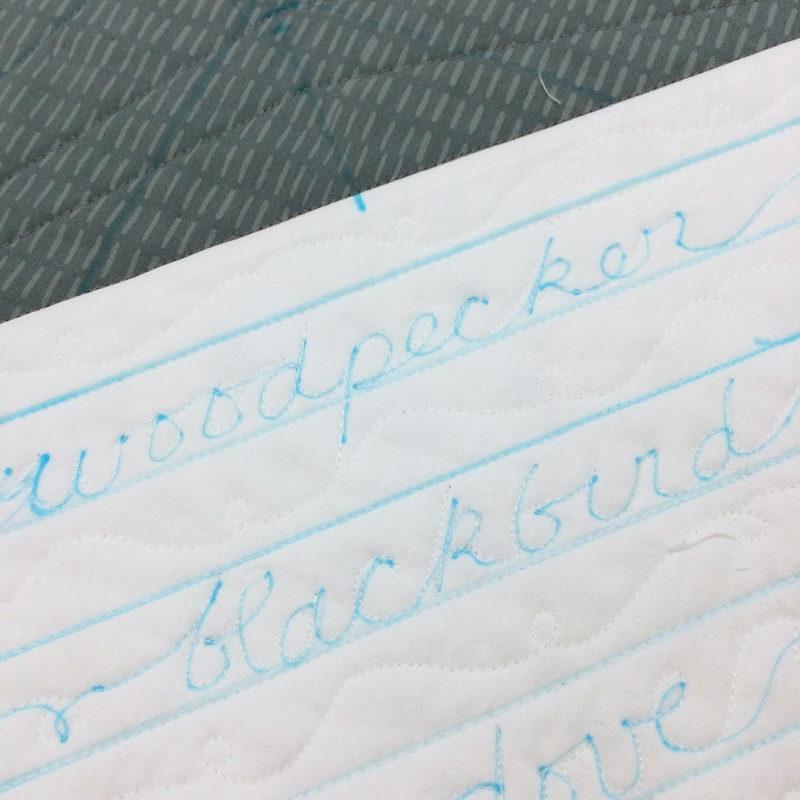 Well, since this was a Birds in the Air challenge I had the idea of quilting bird names on some of the lines. 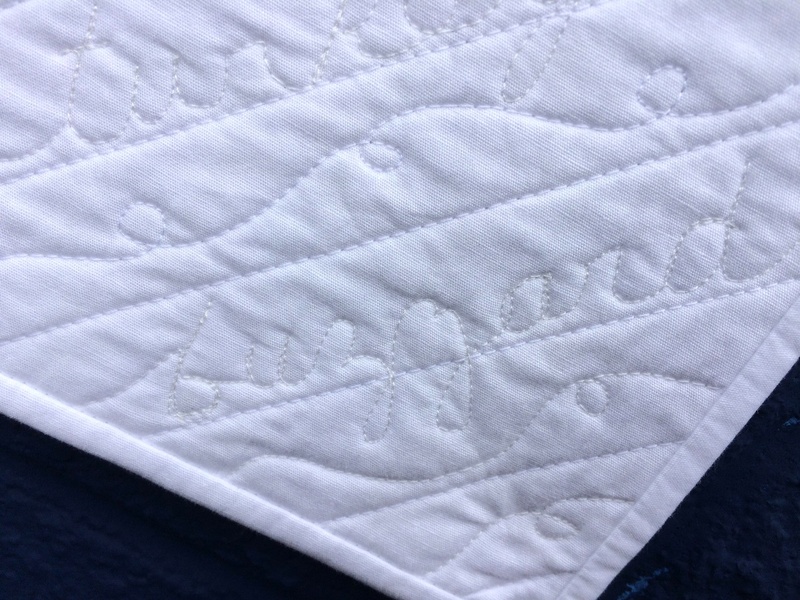 After all, I had some experience with quilting letters when I made the Cursive is a Fading Art quilt. Like with Cursive, I tried to choose bird names without t's and i's but I had too many spaces to fill. Some of the bird names are raven, bluebird, owl, Carolina wren, hawk, pigeon, quail, cardinal, woodpecker, blackbird, bluebird, dove, blue jay and the list goes on. I think there are 28 different names altogether. I wrote out every single bird name using a water soluble marker. On alternating lines, I quilted loops. You can barely make it out here, but the first bird name I quilted was bald eagle. And the very last bird name quilted was buzzard in the bottom corner. As with most of my quilting, I used Aurifil 50 wt. 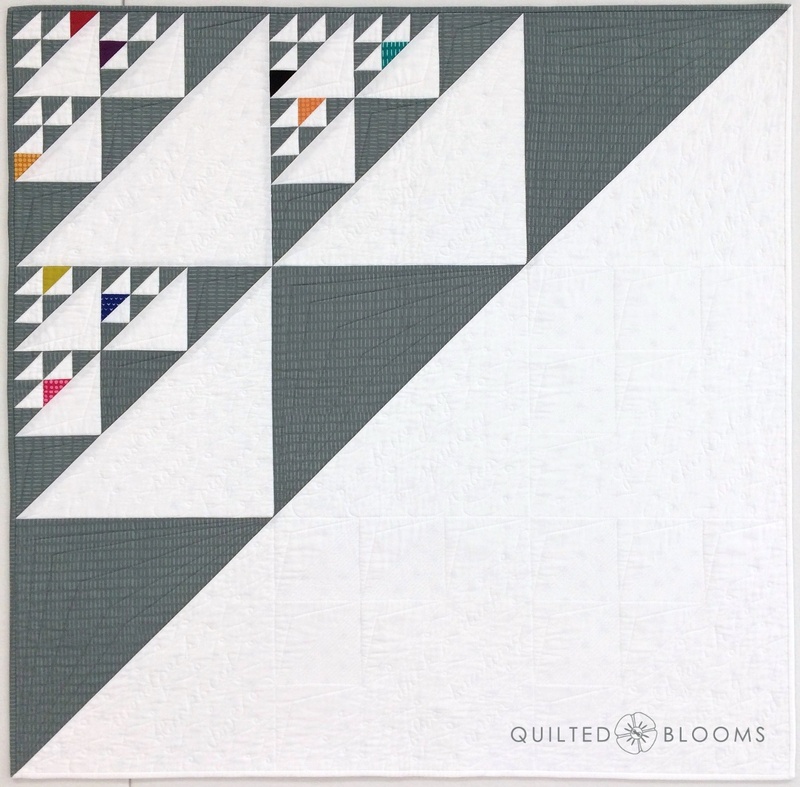 The white is 2024 and for the gray I used 2625 Arctic Ice which you can see in this instagram post along with the weekly block for The Quilter's Planner. 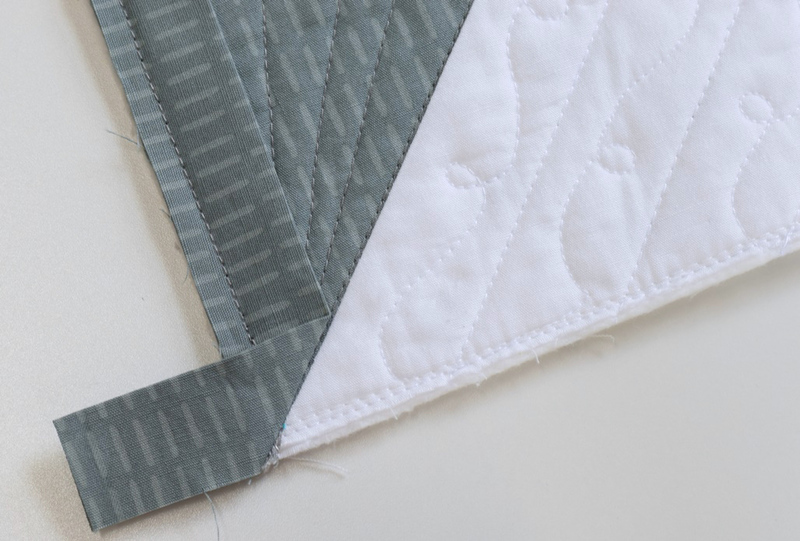 Wanting to binding to be gray on two sides and white on the other two sides, I decided to give the No Tails binding method by Linda at Flourishing Palms a try. It ended up being a little challenge of its own. Since I definitely didn't want to cut off any of the points on those little birds on left and top sides, I made the binding very narrow. I cut the binding strips 7/8" wide. I think that alone contributed to the difficulty. Turning those little corners were quite fiddly. 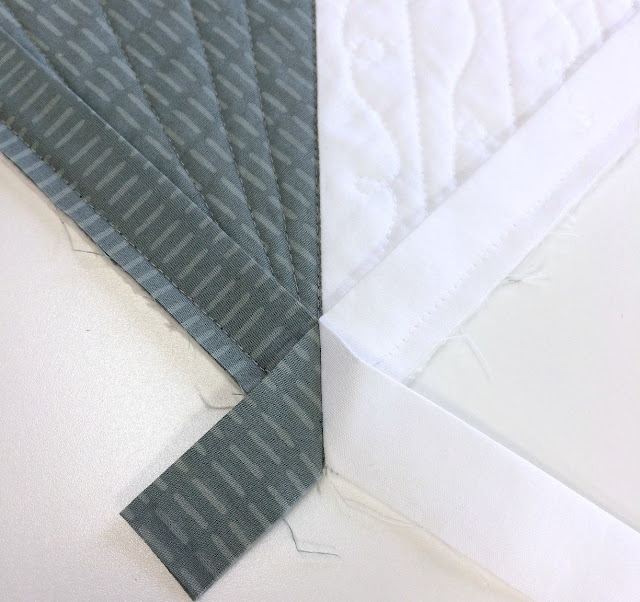 If you are a member of the Modern Quilt Guild, Linda did a webinar titled No-Tails Binding Mitered Corners by Machine. It's available under resources of the Community tab on the MQG website. 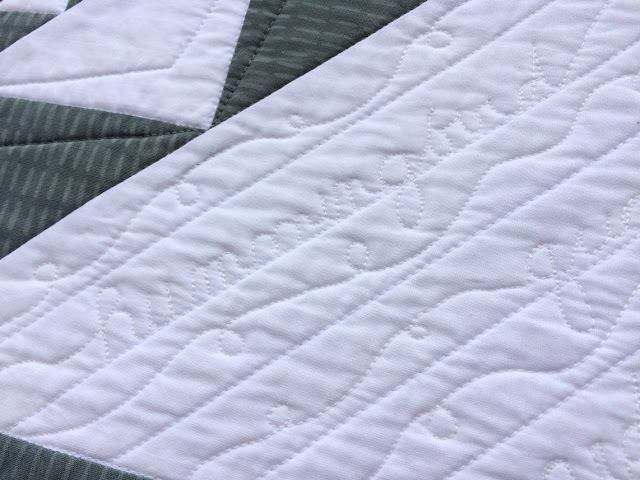 I finished sewing down the binding by hand on the morning of the challenge deadline and still hadn't titled the quilt. It wasn't until later that I decided on the name From Bald Eagle to Buzzard. I was thrilled to win 2nd place in the challenge and you can see all of the Birds in the Air challenge quilts HERE at the Greenville MQG. 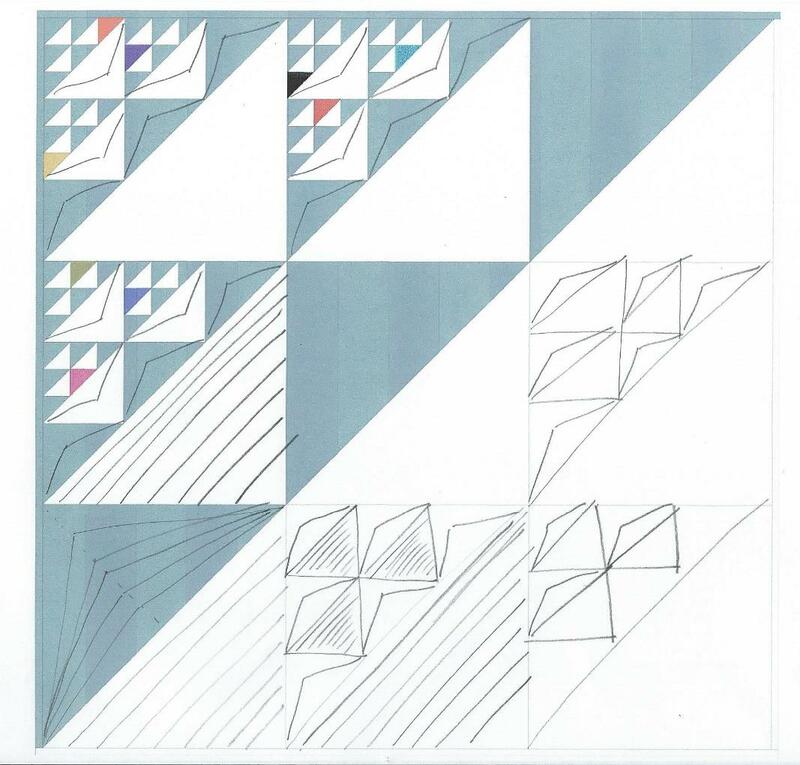 When Yvonne at Quilting Jetgirl wrote about the MQG charity quilt she and the Blue Moon Quilters were working on, I couldn't help but notice the similarities in our designs. I was going to say, it looked familiar. What a stiff competition, and congrats! 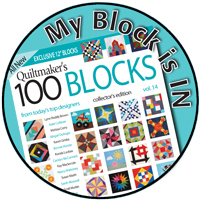 I love the quilting too. 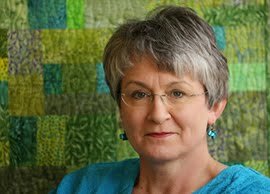 Wow, Paige, no wonder you saw similarity when I shared about the QuiltCon Charity quilt the Blue Moon Quilters are making for 2018! This is fantastic and I really like that you added in bird names to the quilting; great touch. Paige, many good wishes on your 2nd place. What planning and thought, then the names, and the quilting, and a title for your quilt, that is perfect, you are so deserving of a place in this. Your quilts are amazing. This one is equally impressive. I love the inclusion of the ghost quilting and the bird names. I love this quilt. I enjoyed reading your thought process and how you approached each of the challenges - it is really helpful. You do such great work! This is amazing Paige! I love how you embraced the challenge! Deciding how to quilt is always the hardest part for me as well. You did an amazing job and I love how you used bird names! So cool! Paige, I love your original approach to the challenge. 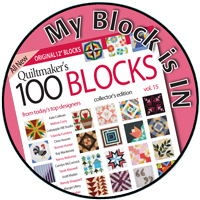 Your quilting with the bird names will be a fun surprise! Paige, this is just awesome! I love how you quilted the bird names! Congrats on the finish. Thank you, Danette! Funny how quilting the bird names wasn't planned at all but worked out in the end and help name the quilt! Another well-deserved ribbon! I love the clean, crispness of this piece and the tiny brightly colored triangles in each sub block. Beautiful! I just love this. The design is awesome, and I really love the quilted bird names. Love this quilt! Congrats.. Thanks, Ann! It was fun coming up with all the bird names to quilt! Love this design Paige! It's just so creative. I especially like the colored triangles you added for a spark of interest, and the quilting. Adding the birds names is a nice touch. That binding looks fantastic! No wonder you struggled with it - 7/8" is a very skinny border! 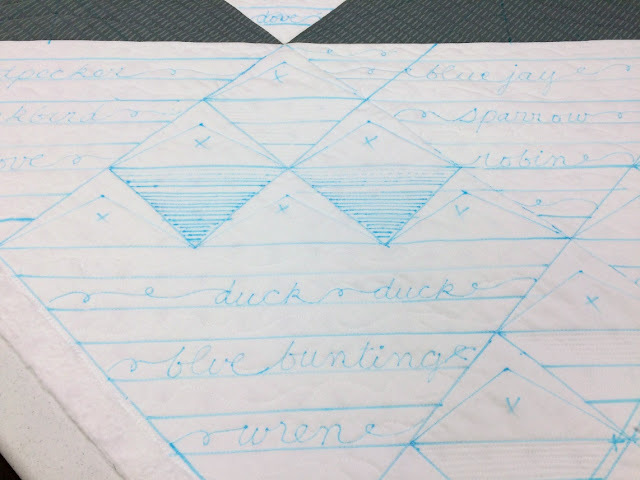 I love this so much - especially the quilting of bird names in the negative space! 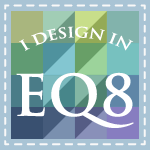 Thank you so much for sharing your creative process in your blog posts too. I really enjoy reading about how you come up with your ideas! Beautiful design and I love the addition of the birds names in the white background. Excellent post explaining your thoughts and progression. The cursive quilting of the bird names really takes this one over the top. Congratulations on your 2nd place ribbon. I'm off to check out the others. 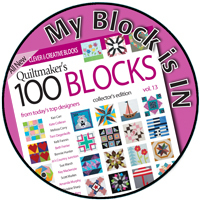 I love your quilt and reading about your creative process in making it in which I kept saying Wow. I have to echo the sentiments in all of the lovely comments you've received. Congratulations! Beautiful quilt! I love how you approached the theme and the attention you paid to details. Very interesting to read about your process too. I really like this quilt, Paige. I saw it on Instagram but had to come for a closer look at the bird names. Beautiful work! Great post on all the process detail! 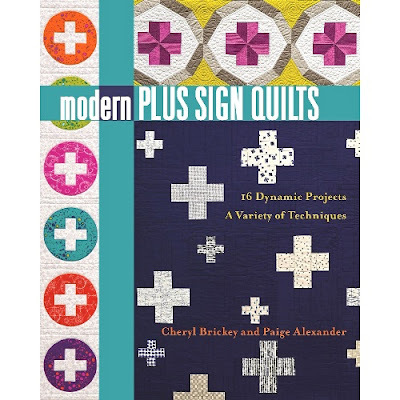 This quilt is wonderful, Paige, and I'm tickled pink that you followed my favorite binding method! I'll say 7/8-inch wide binding is "fiddly!" Goodness! You're a glutton for punishment! But you made it look awesome. You're a natural at challenges, aren't you? And rightly so since you enjoy them so much. Congratulations. You DO have a winner here. Great post Paige, I really enjoyed reading about your process and thinking behind it. 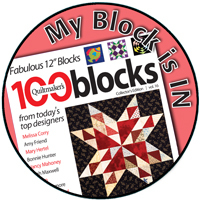 Congratulations on second place, it is very well deserved, I love the quilt, it’s inspired. I never cease to be amazed by your work.